A skill development training on ‘Vegetable production and Marketing’ was organised for people with disabilities from 27 to 29 June, 2017. Total 30 disabled people 27 Male and 03 female including 03 visually impaired persons attended the training at Hotel Kirti plaza, Chittorgarh. To prepare master trainers in relevant trade of livelihood covering all these components. The training was started by Kamleshsharma (Block In charge) with facilitating introduction session and shared the objectives of the training among the beneficiaries. MrKamlesh K Jangid(DPM_SSIP) described that Vegetable crops also have an important role. Vegetables include cauliflower, cabbage, carrot, spinach, mustard (leaves), okra and tomato. In addition, a range of culinary herbs such as fenugreek and coriander are cultivated. The increase in the share of land use for vegetables is partly explained by proximity to the markets. Vegetables, flowers and dairy products are typically high-value and highly perishable products, which need to be, produced where there is easy access to export, domestic and local markets. The move towards high-profit crops is a result of economies of scale: farmers aim to maximize their income from relatively small landholdings using their other plentiful resource i.e. labor. He added that the relatively short growing periods combined with high inputs of irrigation water, pesticides, fertilizers and labor mean that it is possible to produce 3-4 vegetable crop harvests per year from available plot of land. Nevertheless, farmers are generally keen to spread their risk through diversification of crops, and will not opt solely for high-profit vegetable crop cultivation, as vegetables are vulnerable to pest attacks, extreme weather and uncertain access to irrigation. He also explained the important stages for prepare nursery bed as Site selection, Preparation, Planting seeds, Germination and trans-planting. On the second day of training, a field visit was conducted at KVK, Chittorgarh in the leadership of Mr AS Bhati. He showed there a nursery and also revised the methods of making a nursery bed and prepares a tiny plant in a sheet practically and explained precaution in making bed also. Another session was facilitated by Dr. SK Agarwal (Scientist and head of KVK) on irrigation and nutrition requires by vegetable during its germination to till production. The management of irrigation and nutrition are very important for good vegetable cultivation. 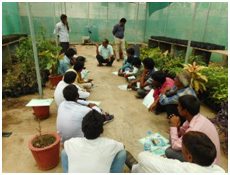 He discussed with the participants about advantages and disadvantages of Drip irrigation in Vegetable cultivation. He also shared about organic farming & its importance through a short presentation & video. He also discussed about disabilities generated using chemical fertilizers & pesticides in the farming. A session on pest, diseases & control was facilitated by MrChesta (From Agricultural Department, Chittorgarh).MrChesta discussed about the common pest & diseases found in the vegetables & suggested the treatments. He also added the precaution of spread diseases & pest. He gave some important tips to make an organic pesticide by Jaggery, Cow-dung & Cow-urine, to control pest & diseases in vegetables. The next session was taken by DrRatanLalSolanki (Subject Specialist-KVK) about the traditional methods & new techniques in vegetable cultivation. At the last day of training, MrSachinBagetiya(DDM_NABARD), MrsAarti Joshi(Social worker and trainer) and MrMadangiriGoshwami(Asst. Centre Coordinator_CUTS CHD)were presented at the closure moment. MrBagetiya shared the various schemes of government and banks regarding agriculture and vegetable production. 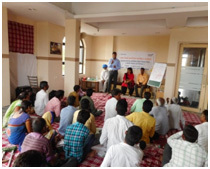 MrGoshwami encouraged the participants to apply the information’s and modern techniques learnt in the training, in agriculture and vegetable production and get more and more benefits in low investment. Mrs Joshi also explained the new approaches used by and in vegetable market introducing the importance of grading and value addition in the business. By the end of the day, the training was closed with heartily thanks delivered by Kamlesh Sharma (BSIF-SSIP) to participants & resource persons to attend the training.